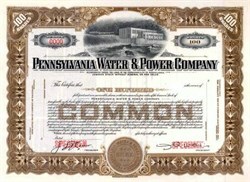 Beautifully engraved SPECIMEN certificate from the Pennsylvania Water & Power Company. This historic document was printed by the Republic Banknote Company and has an ornate border around it with a vignette of a dam. This item has the printed signatures of the Company’s President and Treasurer. Pennsylvania Water & Power Co., became the only power plant in the world to combine a hydroelectric station and a fossil-fuel station on the same site in the 1920's. In the 1950s, Pennsylvania Power & Light purchased Pennsylvania Water & Power Co. and the Scranton Electric Co.
John Abbet Walls earned his degree in engineering at the Massachusetts Institute of Technology. Following his graduation in 1899, he began working for the Niagara Falls Hydraulic Power and Manufacturing Company. He became Assistant Engineer of the Montreal Shawinigan Water and Power Company in Canada in 1901. Later, he was named Chief Engineer of the Pennsylvania Water and Power Company. As Chief Engineer, he designed, and directed the construction of one of the world's largest dams. He was later appointed president. By 1910, the lines at the McCalls Ferry Dam were transmitting electricity to Baltimore and many nearby cities. Following his work on the Safe Harbor Dam, which was opened in 1929, he was named President of the Safe Harbor Water Power Corporation. John Abbet Walls was awarded an Honorary Doctorate of Science by Bucknell University in 1931.